Manufacturer and supplier of drywall, wallboard, and gypsum board. Supplier of gypsum (calcium sulfate). Thai company, a subsidiary of Sahachart Setakit Co.Ltd.with a gypsum reserve of over 50 million tons . Canada. Offers engineering design, equipment supply, project and construction management, commissioning, and technical services for the gypsum wallboard manufacturing industry. A fully-integrated manufacturer and supplier of products and services used worldwide in building and construction, with primary emphasis on gold bond brand gypsum wallboard and joint treatment compounds. Offers Gypsum which is 100% natural and will increases crop quality, yields and improve soil structure. Hi-Ag, Turf-Gyp, Micro-Gyp products benefit a wide range of agricultural enterprises. A designer of gypsum wallboard and wood veneer drying equipment. Wholesale distributor of agricultural gypsum products. High strength and flat gypsum subfloors for new construction or rehabilitation. Natural stone tiles, roofing, and gypsum fibrous plaster manufacturer. specialized in the manufacture of ornamental plaster mouldings in reinforced gypsum. italy. Manufacturers representative for gypsum, stucco, masonry, and related products. manufacturer and wholesaler catalogue of gypsum and resin decorative accessories and occasional tables. Manufacturer of lightweight custom cast, glass reinforced gypsum and cement composite products. Manufactures and markets natural gypsum and calcium sulfate dihydrate for agriculture, livestock and industry. Provider of replacement parts for all types of industrial veneer, gypsum and fiberboard dryers. Casts and paints custom gypsum mouldings and architectural ornaments. Includes photos of sample products. Specializes in soil conditioners and amendments such as gypsum, limestone, sulfur, organic matter (compost) and water soluble polymers. Producer, marketer and shipper of petroleum coke, coal, metallurgical coke, gypsum, and limestone. Manufactures gypsum wallboard, acoustical ceiling tiles, wall panels, and ceiling suspension systems for commercial construction markets. Manufacturers and exporters of titanium dioxide, ferrous sulphate heptahydrate, mixed sulphate salt and ferro gypsum. France. Specializes in supply of capital equipment for plaster industry. Includes gypsum preparation units, burning kilns, crushing and mixing stations, and bagging machines. Maker of spreaders for dry and damp lime, fertilizer, poultry litter, bedding, compost, gypsum, sand, salt, cement, fly ash and any bulk material. Manufactures broad range of mixing and dispensing equipment and accessories. Handling capabilities include adhesives, barrier coatings, cements, epoxies, gypsum, resin matrixes, and rubber materials. Manufacture gypsum ceiling board, mineral fibre acoustic ceiling board and office partitions. A large supplier to the construction and building materials industry for concrete pipe, culverts and block, aggregate, ready mixed concrete and cement, and gypsum. Manufactures and supplies self-lubricating carbon graphite dryer bearing assemblies used in gypsum board, ceiling tile, veneer, plywood, fiberboard, and insulation board dryer applications. Manufactures and markets of plywood, gypsum boards, lumber, and engineered wood products, including laminated veneer lumber (lvl), glulam beams and fiberstrong rimboard. Overview of product lines and vertical markets. The leading construction contractor installing lightweight cellular concrete, gypsum based underlayments and insulating concrete roof systems. Introducing plinth blocks, cast made with glass reinforced gypsum, and matching rosettes. Manufactures recycled paperboard and converted paperboard products, including tubes, cores, composite containers, folding cartons, gypsum wallboard facing paper and other specialty and converted products. Operates plastics manufacturing plants and paperstock recycling and processing facilities. A gypsum cement bat that fits all standard wheel heads. Offers a selection of pottery, hobby, moulding, and white art plasters. Standing at stud palomino overo. Includes sales list, photos, and profiles of horses. Contains foaling chart. Located in Gypsum. SiteBook Gypsum City Portrait of Gypsum in Colorado. 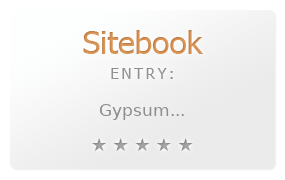 This Topic site Gypsum got a rating of 3 SiteBook.org Points according to the views of this profile site.